Liner: Isotherm 3D Cork Fit with Primaloft. Power Strap: 45mm velcro strap with plastic Powerdriver reinforcement. About Me: I’m an aggressive big mountain skier, who has struggled to find a boot that’s stiff enough (while remaining an all mountain/ not race boot), and has enough ankle hold. The last of my foot is 93-95mm, but I have a thicker instep and calves. I’ve previously been in the Technica Cochise 105W and the Salomon XMax 110W, but ultimately have run into fit problems I was unable to solve. 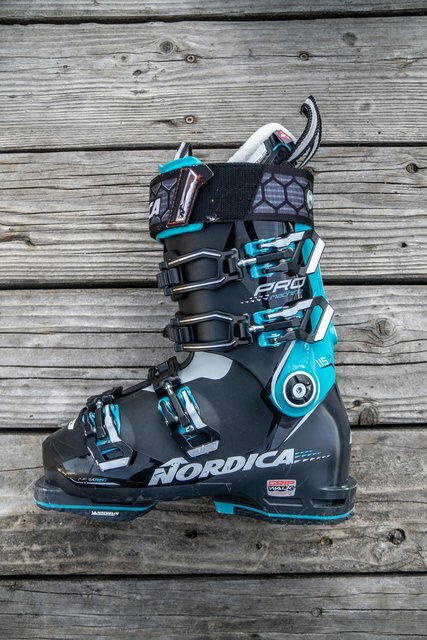 The Nordica ProMachine is arguably the most aggressive freeride women’s boot on the market (excluding plug boots). I prefer not to ski plug or men’s boots, so I’ve always struggled to find women’s boots stiff enough to ride comfortably. The ProMachine was a new mold for the 18/19 season and has returned with updated colors for the 19/20 season. As more brands start to create stiffer flex women’s boots in the years to come, I’m intrigued to see what competitors to the PM arise. The shell has a measured weight of 1300g for each boot. Each boot has 4 micro-adjust buckles, and the position can be easily adjusted with a Phillips screwdriver. More impressively is their “Power Driver” power strap, which has plastic reinforcements along with the strap to evenly distribute power and hold it in place (pictured in cover photo). The ProMachine comes with one of the most impressive stock liners I’ve seen. Full cork around the ankle helps keep it tight and promotes a superior ankle hold. The cork also resists packing out for longer than a typical foam liner. I’ve heard good things about heat molding their cork liners, but the out of box fit worked really well for me so I actually skipped the molding. The liner also comes with an Isotherm fit, which is designed to keep the foot warm and dry. In the past, especially in the Technica Cochise I’ve had my toes freeze pretty much instantly, but I’ve surprisingly stayed warm (/not numb) in the Pro Machine. The majority of my review days were in March, so I’ll report back next January when the temps dip again. The stock footbed is pretty basic, and I switched in my custom footbed (Thanks to Grant at Teton Village Sports). I consistently ski in a 24.5. My right foot measures to about a 25.5 (and seems to be the foot I have the most issues with), and my left comes in a bit smaller than that. I typically have to have my bootfitter put in a small heel lift and/or shim, and reinforcements around the ankle after the liner packs out a bit to hold my ankle in. I was so impressed with how perfectly the liner fit my foot that I actually haven’t gone to see my bootfitter yet. I have a sense that I’ll likely go to get some ankle reinforcements in my right boot after another ~15-25 days or so, but so far I’m not having any issues. The main part of the fit that works so well is the low-volume ankle. The fit is snug for my entire foot without causing any unnecessary pressure points. The ProMachine 115W excels and way-outperforms any other women’s boot I’ve been on (Salomon X Max 110W, Technica Cochise 105W). It’s aggressive, smooth, yet still comfortable, all while holding my feet in place. I found that my skiing felt stronger instantly (and I even got compliments from my ski partners about how well I was skiing). 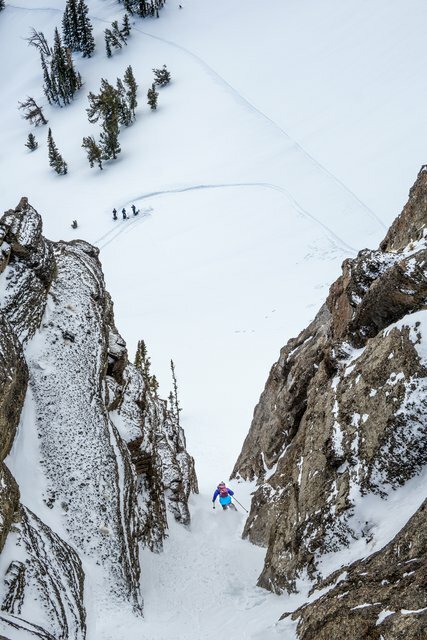 The boot is damp, responsive, and stiff enough to drive my skis in a wide variety of snow conditions and temperatures. 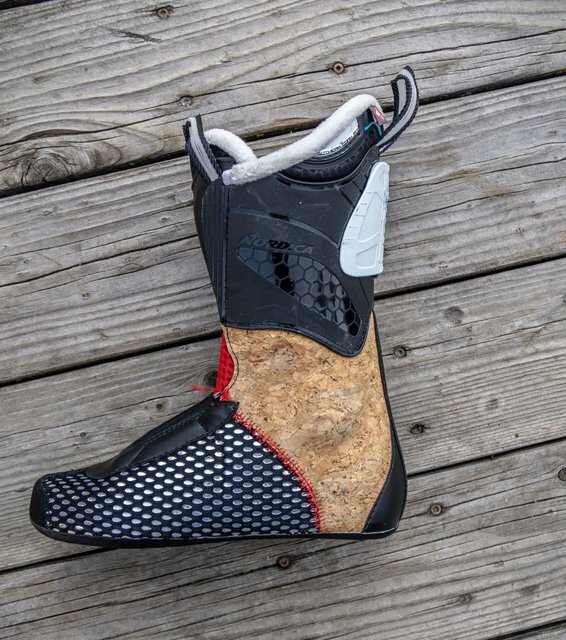 I’m really impressed with how well it performs and would agree with my former statement that they’re likely the most aggressive women’s freeride boots out there. I’ve stuck with the Grip Walk soles, which I’ve been really impressed with and have made both rock scrambles and walks through the parking lot more enjoyable. I’m impressed by the durability of the boots– the liners so far are really holding up and not packing out at all, and the shells are pretty much untouched besides a few minor cosmetic scratches. I expect to be able to get 100+ days on the liners and another 100+ from the shells. 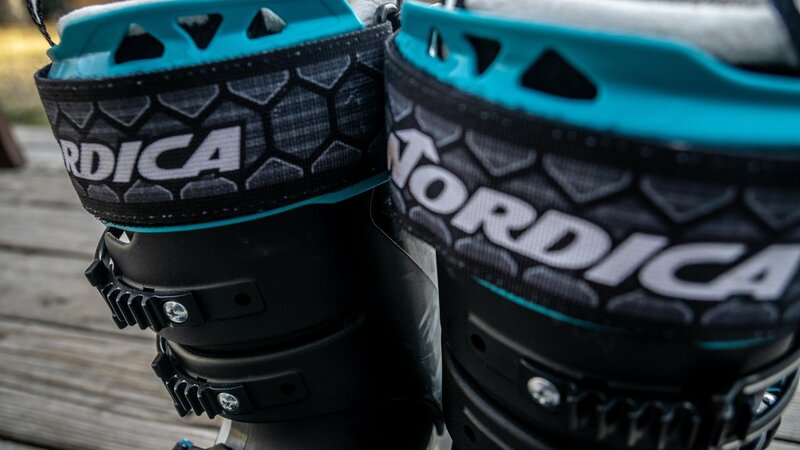 If you’re an aggressive women’s skier and looking for a low-volume and high-performance ski boot, try on the Nordica ProMachine 115W and see if it is a good fit for you. I’m so excited to find a women’s specific boot that holds my ankle in place and arguably makes me a stronger skier. I’ve had a lot of nightmare ski boot experiences in the past, but you’ll be finding me in these boots for years to come.